Ever been in the middle of a cafÃ© or at work and needed a short toilet break, then thought about taking your brand-spanking new Apple iPad with you so it doesn’t get stolen or damaged? There is a solution to this: lock it up! Ok, maybe you wouldn’t leave it in the middle of a cafÃ©, library or anywhere as such, but there is a solution from MacLocks that will cover up your iPad with a plastic case and Kensington-style cable lock to deter prying eyes (and hands). If you have an iPad, you know what I’m talking about. It may not be socially acceptable to take your iPad with you everywhere you go, but you are always going to be known around the office as ‘the person with the iPad’. With this solution from MacLocks, you can safely go for a short break whilst leaving your iPad safe and sound, locked down to your desk (or wherever you may be) without having to worry too much about it. The iPad lock and screen protector can be pre-ordered via MacLocks for just $65, which means you can get on with other day-to-day activities whilst having the pleasure of knowing that your shiny new iPad is going to there waiting for you when you get back. Just make sure you don’t lose the keys. 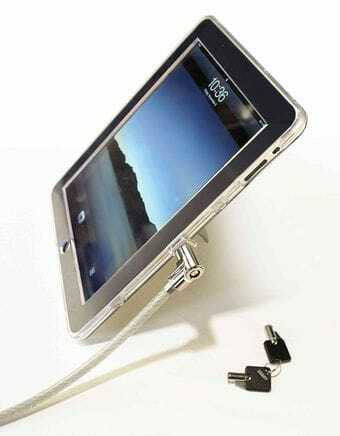 What do you think about the iPad lock solution from MacLocks? It may be a neat tool; be aware that MacLocks, CompuLocks, et al provides poor service and no refund for wrong product.